Berry Lodge Farm is a period property that comes with not one but two detached homes. Berry Lodge Farm in the village of Welland in Malvern. Three-asy does it at Berry Lodge Farm, a period property that comes with not one but two detached homes. 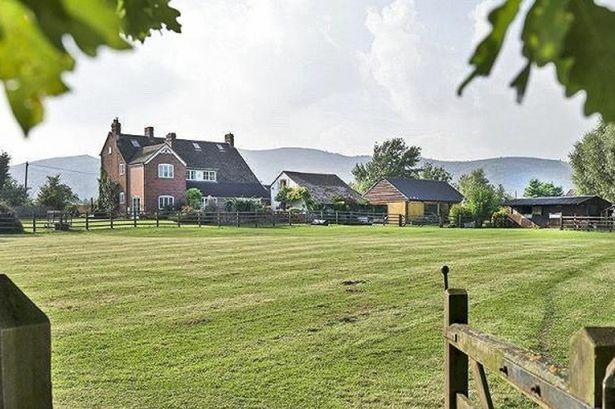 The farm, which is in the village of Welland in Malvern, has Georgian origins and Edwardian extensions. It has also been added to more recently by the current owners. The main house includes a large kitchen that has a contemporary country feel, with ample space for dining. Its units have granite worktops and there is a gas-fired Aga, Bosch integrated electric oven, Bosch integrated microwave, De Dietrich induction hob, American-style fridge freezer and a Fischer and Paykel dishwasher. A central island with an oak top features a wine fridge. Off the kitchen is a utility/boot room with a quarry tiled floor, Belfast sink and more units. The cosy sitting room features an oak floor and wood burner set in a brick inglenook. The views from this room look across to the Malvern Hills, an outlook shared by the dining room, which also has exposed floorboards, built-in shelving and an original fireplace. A recent addition is the garden room, complete with more oak flooring and doors to the garden and paddocks beyond . There is also a study, a hobby room, a shower room and two cellar rooms. On the first floor, the master bedroom has an original fireplace and recently installed en suite with roll top bath, shower cubicle, walk-in dressing room and paddock views. Of the four other bedrooms on this floor, two have built-in wardrobes. A roll top cast ion bath is a real feature of the family bathroom. There is a spiral staircase to the attic rooms on the second floor. These were used as bedrooms and a bathroom but could potentially become a home office or staff accommodation. The Coach House is an attractive cottage which would be perfect for guests or for elderly relatives. It has a well-appointed kitchen, dining room, sitting room and a bathroom on the ground floor. Upstairs is a galleried double bedroom with built-in wardrobes and a generous dressing/seating area. The Dairy has planning permission for commercial use which means it could be rented out to holidaymakers. Solid oak flooring throughout, hardwood doors and windows give it character . It has two bed/sitting rooms with kitchen areas and en suites, one with bath, the other with shower. Next to these there is a large utility/laundry room with Belfast sink and appliance space. A parking area has space for a number of cars and there is a four-bay car port. A formal garden has been created to the front of the main house which captures the best of the evening sun and has views of the full range of the Malvern Hills. There are two large paddocks and one smaller paddock with a stable and work shop. Next to this is a livestock pen.